This is a collection of information coming from different sources, my task was to reorganize them in a readable shape and make it available. Surfing on the net I found the website dedicated to the VI Corps Engineer Combat Regiments. Marion J. Chard and the guys of the VI Corps Forum put me on the right track with help and hints in searching the information. of the 316th Engineer Combat Battalion. The 316th Engineer Combat Battalion was activated on 15 August 1942 at Camp White, Oregon, as part of the 91th Infantry Division. Its officer cadre had come from the Engineer, Fort Belvoir, Virginia, where it had been assembled from various units. The enlisted cadre come from the 8th Engineer Squadron, 1st Cavalry Division, at Fort Bliss, Texas. The Battalion trained at Camp White until it departed on 1 September 1943 to participate in the IV Corps maneuvers in eastern Oregon. Following the maneuvers, the organization returned to garrison at Camp Adair, Oregon, refitting and training until alerted on 20 January 1944 for overseas movement. The battalion departed from Camp Adair on 19 March, completed its staging period at Camp Patrick Henry, Virginia, and sailed from Hampton Roads Port of Embarkation on 1 April. Most of the battalion, together with other units of the 91st Division, landed in Oran, Algeria, on 20 April, while the remainder arrived on 1 May. In Algeria, the engineers went into a period of intense amphibious training along the Mediterranean coast east of Oran and each company participated in realistic landing exercises in the vicinity of Arzew. Company “A” left the battalion and went to Italy with the 361st Combat Team on 22 May 1944. The 91st Division entered the line again on 10 September at Pratolino, a few miles above Florence on Highway#65. The 316th Engineer Combat Battalion supported the advance by work on Route 365. From Pratolino to S. Pietro (San Piero a Sieve), the engineers had to repair twenty-seven craters. There was no opportunity to learn how the infantry was advancing along the heights beside the road, so division reconnaissance units travelled the highway with the advance engineer vehicles, providing them with security. The leaders pushed aggressively, and the progress was rapid. When the division broke into the Sieve Valley at S. Pietro (San Piero a Sieve) and Caffagiolo (Cafaggiolo), it confronted the Gothic Line. On 13 September, the division began to attack, and as it moved forward, the 316th built jeep and mule trails up the mountain sides. Each night work parties went forward to breach the minefields and push the small roads further up the cliffs. As Futa Pass was approached, the engineer problems were mostly abatis and numerous craters. Just before the pass was reached a tall bridge was blown and a Bailey bridge was installed. Next a crater was filled at the pass, and then the 316th was across the divide and past the main Gothic Line defenses. Highway #65 remained the responsibility of the 316th Engineers. To supply the division troops, lateral roads were dozed from the highway and up into the hills. Then, as the rains came in September, mud entered the picture. Vehicles were road bound: roads became impassable. Even the hard-surfaced Highway #65 became difficult to travel. A dry weather crater, requiring perhaps one platoon-hour to fill, became a monumental task to open and maintain during the wet weather. The dearth of gravel was heart-rending. Houses were continually pulled down for rock. So it went. Up over Radicosa Pass, past La Posta, and Filigare, to Monghidoro. At Monghidoro, the 316th changed the road policy from one of immediate one-way traffic at all costs, to one of permanence and minimum maintenance. The advantage from Monghidoro through Livergnano during the first half of October presented many obstacles. Forty craters were filled, three road blocks removed, nine culverts installed and thirteen bypasses constructed. In the days following the occupation of Livergnano, the new missions for the engineers decreased in ratio to the decreases in new ground taken. After the roads to the front were opened and the lateral trails cleared and swept, more men and time became available for improving the route which had already been hurriedly opened as the division had moved north. The engineers now returned to widen and improve these roads for two-way, heavier traffic. On 22 October, the 316th began to aid in the erection of defense fortifications for the infantry. As a static phase was entered, barbed wire obstacles, mines, and cratering charges were used, so that only a minimum number of foot troops would be required to be on the line at one time. Anti-personnel mines were laid before the infantry positions, as well as concertinas. 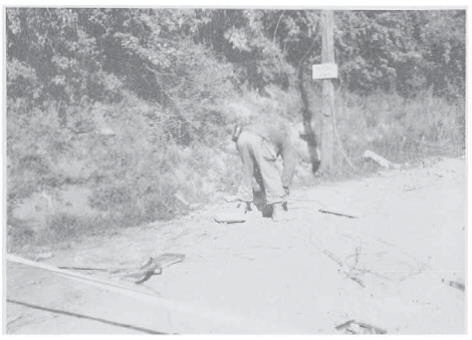 On the highway north of Livergnano, the 316th combat Battalion had filled a crater blown by the retreating Germans. Now, in defensive positions, the Americans returned and placed their own cratering charges in the same spot. This defensive mission of strengthening and improving the positons was not finished until November. In the latter part of that month, the battalion went back to Montecatini and Pistoia for its first complete rest since entering the lines in July. The unit was back on the line in the Highway #65 sector the first week in December. Time was spent checking the cratering charges placed earlier, and maintaining the roads, as well as improving living conditions as much as possible. 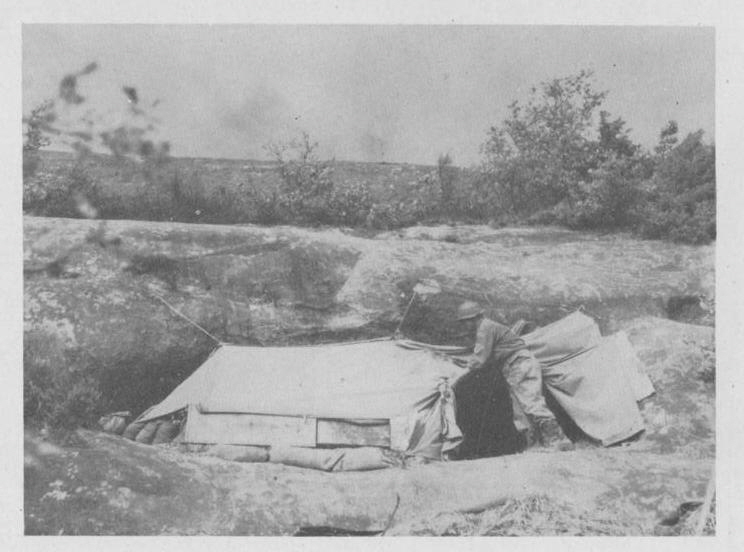 Three caves in rock cliff in the Sabbioni area were turned into “barracks” complete with double bunks. Doors were made of scrap wood and materials salvaged from shelled buildings. Other men built “bungalows” from scrap wood, sandbags and shelter halves. But most outstanding was a 60-foot by 30-foot mess hall, which was made from several thousand sand-filled 105 mm howitzer shell cases. At night, the mess hall was used as a t heater for the engineer troops. Extensive reconnaissance work was done in December for the planned offensive, and engineer plans were made. After an extra heavy shelling of the bivouac area on 16 December in which the mine and explosive dump was hit, the battalion evacuated the area and headquarters was reestablished in the town of Monghidoro. Defensive work was the main task in January. The 91st moved east into the Idice sector, to replace the 34th Division in February, and once again road maintenance had to be stressed, especially as the warm weather brought back the problem of mud. The Roads gradually became greatly improved–the warmer, drier weather of late February and March hastened the process. In about mid-March, the 91st Division was relieved of the Idice sector by an Italian group, and the 316th Engineers set up bivouacs on the Sieve River a short distance off Highway #65 to take bridge training, instruct the infantry in mine warfare, and generally prepare for the spring offensive. After two weeks, the 91st Division began moving back into its position in the sector straddling Highway #65. In preparation for the passage of tanks on the eve of the attack, a difficult culvert and fill was installed by the 316th at the four-house settlement of Barchetta in the vicinity of Pianoro, within a few hundreds yards of the enemy. Fords were prepared and mines cleared for the attack on Mount Adone. With the taking of Mount Adone and Pianoro, the main German barriers before Bologna fell. As the advance move forward, the engineers swept roads and improved trails and roads. After the 91st Division went to Bologna, it crossed the Panaro River by the bridge that the 88th Division had captured and proceed to the Po. The engineer mission was concerned mainly with clearing the roads of dead horses and burned vheicles. On 24 and 25 April, the 316th Battalion crossed the 91st Division over the Po at Sermide, about seven miles east of Ostiglia. Ferries and raft were used until the corps floating bridge was completed for the larger vehicles. The assault boats and the DUKW’s employed on the Po were kept well forward and were ready for use as soon as the bank of the Adige was cleared near Legnago on 26 April. Assault troops crossed on a partially repaired railroad bridge nearby. Company “A” crossed one regiment several miles upstream by an infantry support raft. The 402nd Combat Battalion constructed an M-1 treadway bridge at Legnago on 27 April. By that date, the entire division was across the Adige River and continuing the pursuit of German toward the northeast. Vicenza was captured and the division went due eastward. 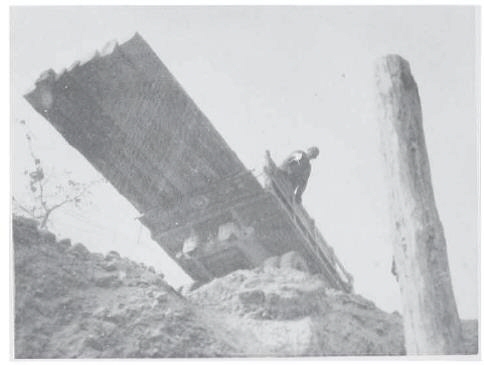 The Brenta River was crossed first by “snaking” vehicles across the shallow stream with bulldozers, and then by a trestle tradway bridge constructed by corps engineers. During the crossing, members of the 316th Engineer Combat Battalion were engaged in several fire skirmishes with the enemy in which several men were killed or wounded. The advance was so rapid that there was little or no road repair work necessary and no mines to delay the attack. Battalion Headquarters moved into Treviso of the afternoon of 30 April, with Companies “A” and “B”. Company “C” joined the remainder of the battalion there the following day. The 316th under the command of Lieutenant Colonel Williams C. Holley was mainly engaged in the roundup of prisoners after the surrender of the Germans on 2 May.